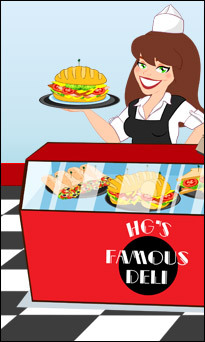 Visiting a sandwich shop or deli? Check out our go-to tips, followed by what (and what not) to order from popular chains! Keep the bread small. This doesn't mean your sandwich has to be tiny. You can load it up with lots of lean protein and fresh veggies. But start with slim slices of bread or a flat bun... not a giant tortilla or foot-long roll. Calorie-saving bonus: Ditch the top, and eat it open-faced! Or skip those carby calories altogether with a "lettuce bun" -- a.k.a. giant leaves of lettuce in place of bread. Lean meats 101: More than turkey. Turkey breast is a well-known favorite, but there are other low-fat deli meats as well. Chicken breast, ham, and roast beef are ALL great options. Try to avoid salami, pepperoni, bologna, and bacon. Meatballs and mayo-packed tuna salad are also on the no-no list. Cheese: Take it or leave it? If you're going veggie-style and skipping the meats, a slice or two of cheese can be a good way to add some protein to your meal. Each slice has around 80 calories and 6g fat. 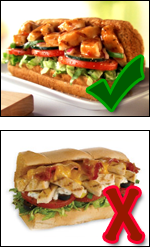 But if your sandwich is already piled high with protein, you might want to skip those cheesy calories. Big flavor; little calorie counts. Pickle chips, jalapeño slices, banana pepper rings, and sliced olives will all add major flavor without adding lots of calories. If sodium is a concern, you might want to limit these extras. Instead, request some red pepper flakes and oregano. Careful with the condiments! Mustard is a smart selection, as are red wine vinegar and light vinaigrettes. Light mayo is good if they have it, but you'll probably want to ask them to go easy on the stuff. Mayo is notoriously overused at sandwich shops! Select sides wisely. Why are cookies and chips the default options? Baked chips are okay, but do you really need a side of carbs with your sandwich? Luckily, fresh fruit, soup, and side salads are often available as well. Stick with broth-based soups. And when using salad dressing, choose something light, and then dip (don't pour). Good Idea/Bad Idea: Sandwich Edition! Lean chicken glazed with a sweet fat-free sauce? YUM. Get a six-inch 9-Grain Wheat sub with fresh veggies and no cheese for 330 calories and 4g fat. Ugh. The cheese, bacon, and dressing counteract the lean properties of the white-meat chicken. Even a 9-Grain Wheat six-incher packs 540 calories and 26g fat. Click here for nutrition info! With a few modifications, you'll have a tasty sandwich that's totally guilt-free. Ditch the cheddar and swap the ranch dressing for Honey Bourbon Mustard (YUM). You'll still have ham, roast beef, turkey, and more! A small wheat-bread version will clock in at 368 calories and 8.5g fat. 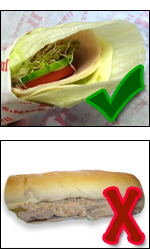 Following Blimpie's "Favorites Made Lighter" specifications, a six-inch version of this sub without the sauce (but with the cheese!) will have 330 calories and 9g fat. Yeesh! Even if you stick with a six-inch order, this meat-free sandwich has 610 calories and 27g fat. Too much cheese! The Unwich option swaps bread for a lettuce wrapper (YES! ), and you can give any sub or club sandwich this treatment. With this one, just ditch the mayo... Then your low-carb order of turkey, avocado spread, provolone cheese, and veggies will come to about 200 calories and 10g fat. Impressive! Do not be fooled by the word slim! In this case, it means "minus the veggies and sauce." Why would anyone banish the veggies?! This sandwich has 765 calories and 31g fat. FAIL! There are actually two good ideas when it comes to this pick. 1) Get a Mini on wheat for 340 calories and 7.5g fat, or 2) get it "in a tub" -- in other words, as a salad -- for 240 calories and 10g fat. Nicely done, Mikey! You are now entering SHOCKERVILLE. This vegetable wrap -- no fatty meats in sight -- has a mind-boggling 810 calories and 46g fat. Kinda horrifying, no?! 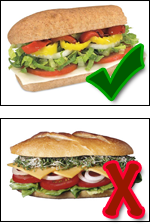 Almost everybody eats sandwiches -- click "Send to a Friend" to pass around this helpful info! 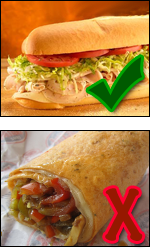 Today, September 14th, is Eat a Hoagie Day. 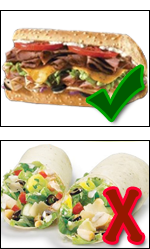 Before you run out and grab a big ol' sandwich, make sure you read the above info carefully. Then ENJOY!! !